Normally I don't post this kind of stuff on my blog, but seeing someone suffer and deliberately ignoring them is a sin, according to my own values, belief and judgement. And so, I put forth this request to all those capable of helping this child in need. 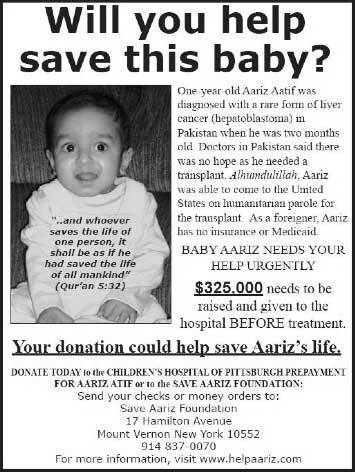 Aariz Atif is a one year old baby boy, currently fighting for his life in Pittsburgh, PA. Aariz needs a liver transplant to combat a rare form of liver cancer called Hepatoblastoma. The Children's Hospital in Pittsburgh is hopeful and ready to get Aariz the liver he needs within a relatively short period of time, pending some presurgical screening and clearance. The stumbling block? Money! As an international patient with no insurance and a family with normal means, Aariz cannot pay $300,000-$335,000 in cash to get a shot at what we all take for granted, i.e. life. The policy of the Children's Hospital requires a deposit of $300,000+ before Aariz can qualify to receive treatment. The family has thus far raised approximately $80,000, enabling them to at least get Aariz through the tests and interim treatment. However, his only real chance at survival is a liver transplant and for that, the family critically between $300,000-$335,000, as soon as possible, to make a deposit into the Children's Hospital account set up for Aariz. You can read more about this on The Saturday Post or at the website set up for Aariz; Help Aariz. If you want to donate, here's where you can find the information. 15/04: Want a product key for Windows XP or Windows Vista? Google and Belarc have come together to give you, the user/reader, the product keys for Microsoft Windows XP, Microsoft Windows Vista, Microsoft Office and a lot of other software [Dreamweaver, Photoshop, Symantec antivirus, etc]. Don't believe me? You might have to keep searching until you find a key that works since OEM keys won't activate again on a different computer. This is a rather old method (first found about one year ago) but strangely enough, it works even now. It appears that Microsoft, Belarc, Google and the Belarc users themselves have done nothing to remove these Belarc profiles which are available online. Even the keys haven't been blacklisted. I would strongly urge Microsoft to blacklist these keys. Other people will keep using these keys so long as they are available or working. This also doesn't reflects well on the anti-piracy drive by Microsoft and other software vendors which I talked briefly about in a previous post titled "Windows XP activation woes and piracy in Pakistan". To the reader: If you do get the product keys using this method, know that it is your own risk. I bear no responsibility in this regard for whatever happens to you, your PC or anyone/anything else. This post is for informational purpose only. I just finished reading an article on madrassas in Pakistan (the main focus) and India (toward the end). It provides an insightful look into the madrassa system. What sets this article apart from others is that it claims that there is little relation between the often demonized madrassas and those responsible for 9/11 and 7/7. This article was written in 2005 and in the following two years, there have been significant improvements regarding education in Pakistan. These improvements include a significant increase in the education budget (evident from the high number of HEC scholarships) and free education up to matriculation in at least one province. There are often huge debates about these madrassas. From where I stand and view them, I consider them essential considering the environment and dynamics in Pakistan. These madrassas house a huge number of children and young adults who would otherwise be roaming the streets and indulging in social ills. What I would emphasize and support is a more stricter control over the curriculum taught at these madrassas. While steps have been taken in this regard, they have been left hanging and not taken to the conclusion. I fully believe that religious education in itself, is not enough to survive in today's competitive world. Science subjects should be taught alongside religious subjects to enable these students to survive in the real world outside these madrassas. Even the beloved Prophet Muhammad (PBUH) emphasized and stressed the importance of education and knowledge [the acquisition of which should start from the cradle and end at the grave] for Muslims. Who are we to limit the knowledge and education any Muslim acquires [or wants to acquire]? 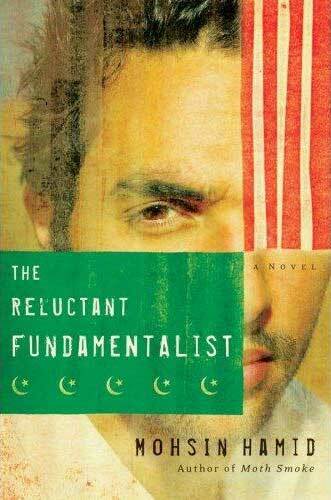 Shortly before four British Muslims, three of them of Pakistani origin, blew themselves up in the London Underground on July 7, I travelled along the Indus River to Akora Khattak in the North-West Frontier Province of Pakistan. Here, straddling the noisy, truck-thundering Islamabad highway, stands the Haqqania, one of the most radical of the religious schools called madrassas. Many of the Taliban leaders, including Mullah Omar, were trained at this institution. If its teachings have been blamed for inspiring the brutal, ultra-conservative incarnation of Islamic law that that regime presided over, there is no sign that the Haqqania is ashamed of its former pupils: instead, the madrassa's director, Maulana Sami ul-Haq, still proudly boasts that whenever the Taliban put out a call for fighters, he would simply close down the madrassa and send his students off to fight. In many ways, then, Akora Khattak represents everything that US policy makers most fear and dislike in this region, a bastion of religious, intellectual, and sometimes - in the form of the Taliban - military resistance to Pax Americana and all it represents. A dust storm was blowing as we crossed the Indus just below the massive ramparts of the fortress of Attock, once the great bulwark protecting India against incursions from Afghanistan. The road was lined with poplars. In the distance towered the jagged dragons' backs of the blue Margalla Hills; a graveyard lay to one side, its green grave flags fluttering in the breeze. A few kilometers beyond the river stood a ramshackle line of buildings, all built in a crude modern concrete version of Mughal architecture. Washing was hanging up to dry from the roofs and verandas of the dormitory blocks, and in the main courtyard students were bustling around. All were male, all wore turbans, and all were heavily bearded. "That is for American consumption only," he laughed cheerfully. "It is only statements to the newspapers. Nothing has happened." This originally appeared on the Digital Vision Program site. The program is from Stanford university and Reuters Foundation. I consider this to be yet another achievement by Pakistani universities who are making their name in various fields of development and research. We need more concentrated effort to promote such things at the academic level. In today's world, competition is not just within the university, city or country. Today, competition is worldwide and extremely tough. So buck up and get ready for the ride than being left behind. NUST Institute of IT (NIIT) along with Stanford University is currently collaborating on Reuters Digital Vision Program (DVP). One of the major underway DVP projects is Jaroka: Tele-healthcare proposed by Atif Mumtaz (06, 07). Jaroka is a web-based tele-health care portal that enables clinicians operating in disaster affected communities to get rapid diagnosis, expert advice, and opinions from specialists around the world. NIIT has established a dedicated team comprising of its faculty members and young students to play its role in this project. This project is succeeding under the supervision of Dr. Arshad Ali (Director General NIIT). Dedicated faculty members (Dr.Amir Shafi, Mr.Adnan Iqbal , Ms.Shamila Keyani) and students are now working towards telemedicine initiative within the college. In order to foster the progress, regular seminar series on the relevant topics are arranged every Wednesday and the progress of students is monitored on a regular basis. Also, NIIT has been able to successfully persuade Army Medical College (AMC) to setup their first medical collaboration with NIIT and Stanford. NUST Institute of Information Technology has always been committed to providing a stimulating educational experience within the framework of vibrant research environment and to supporting high-quality research and research training that is relevant to national needs and is of social, commercial and cultural value to the community. NIIT- Stanford collaboration will play a significant role in development of cutting edge technology in the field of Tele-health care.